Check out Monster Terrain Kickstarter by Monster Fight Club for some excellent looking terrain for your gaming needs. Alliance Distributors has notified us that it will no longer carry our line of BattleTech miniatures. In addition, we directly support a number of retailers who prefer to order direct from the manufacturer. Our retailer support person is Melissa Noe [officewench@ironwindmetals.com]. She can supply you with BattleTech miniatures as well as our full range of Ral Partha fantasy and historical miniatures. We appreciate our long relationship with Alliance, which dates back to the early days of Ral Partha Enterprises (our predecessor company) and wish them well. New Battletech Releases are now available from Iron Wind Metals web store, in the Battletech New Release Category. Shout out to Miniature Building Authority’s Harbor Town Kickstarter that is going on now. A great new terrain offering from them to go with all of there other buildings and themes that they sell. 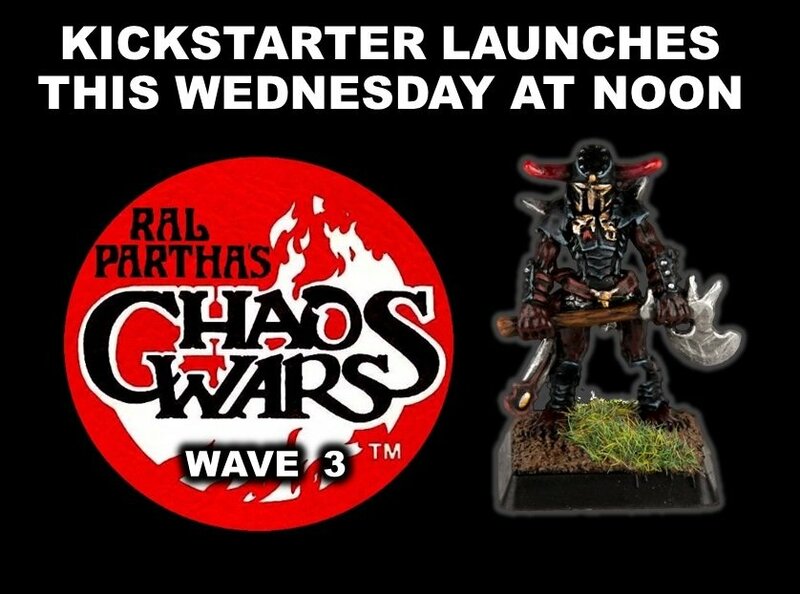 New Chaos Wars Kickstarter is Launching Wednesday at Noon. New Web Only Battletech Releases are now available from Iron Wind Metals web store, in the Battletech New Release Category. 2nd Quarter 2018 Battletech Releases are now available from Iron Wind Metals web store, in the Battletech New Release Category. Luke Gygax teams up with his friends at Wizards of the Coast, Iron Wind Metals and Dwarven Forge to reflect on the foundation of Dungeons & Dragons and celebrate its phenomenal resurgence. Join Luke and host, Satine Phoenix, as they discuss the origins of D&D from its creation in the tiny town of Lake Geneva, Wisconsin in 1974, to its massive influence reflected in the popular culture today. Founders & Legends is a celebration of the men and women that pioneered roleplaying games, and we are celebrating by doing what we love so much—playing D&D! There will be three amazing adventures streamed live on July 28th. The first is a classic game of Advanced Dungeons & Dragons with Dungeon Master Stefan Pokorny. Following his game there will be two fifth edition adventures: Maze Arcana with Satine Phoenix, and a very special finale with D&D Franchise Creative Director Mike Mearls. Guests include industry leaders and celebrity players Joe Manganiello, Jason Charles Miller, T.J. Storm, Kelly Lynn D’Angelo, Mike Noe, Ruty Rutenberg, Amy Vorpahl, and more. We play a lot of Dungeons & Dragons, both in front of the camera on D&D Twitch channel and behind the scenes. But there’s nothing more satisfying than playing D&D to raise money for kids. Extra Life is a charity organization we’ve been happy to be involved with, where gamers stream themselves playing with the express purpose of driving donations to children’s hospitals. For 2018, we’re expanding our livestreaming and other efforts taking place throughout the year. For starters, as part of Founders & Legends, we’ll be raising money in support of Extra Life. Look for further details at Extra Life Team D&D, and please consider donating to the cause. Founders & Legends livestreams Saturday, July 28 starting at 10AM PDT. Watch events all that day on the D&D Twitch channel. 1st Quarter 2018 Battletech Releases are now available from Iron Wind Metals web store, in the Battletech New Release Category. Also 2nd Quarter releases have been added to the New release category so you can see what they look like as coming soon. They will be available for sale from IWM website in a few weeks. Gen Con 51 is getting closer and Iron Wind Metals will be at the show (Booth 2543) with the usual full Battletech Line, Bulk Fantasy and Sci-Fi bins, Hackmaster, Chaos Wars, Gendel Resin Terrain, SciFi Resin Building and a variety of other items for sale. The list below is all of the new Battletech releases that we will have at the show, Con Specials (Lance Pack), and Limited Edition Jumper. I will update the list as we get close to the show as I am able to confirm what else will make it. Our friends at Catalyst Game Labs have a Kickstarter campaign going on for Shadowrun: Sprawl Ops and it has been doing fantastic with being funded already. Check out the link to there Kickstarter for more details about this new game for Shadowrun fans.